CoolPaintrVR is the awesome experience of painting in 3D space with virtual reality, unique on PlayStation®VR, where you will be able to walk around your artwork. Through an intuitive UI designed for all audiences, you will be able to use multiple and stunning brushes to enjoy feeling like an artist. Express your mind freely, share it with the world and let your imagination flow into space! Live the awesome experience of painting in 3D space…it’s like getting inside your own creation! Imagine a sophisticated 3D engine capable of maintaining stable 120fps, that is able to turn your playing time into a smooth, accurate and motion sickness-free experience. 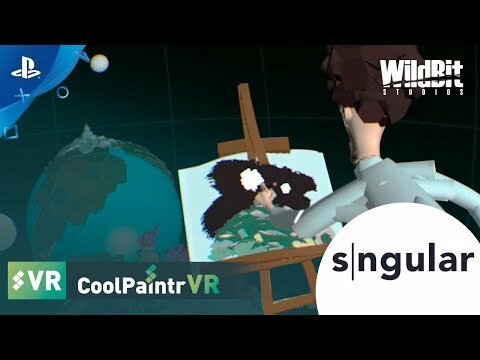 CoolPaintrVR ©2017 Wildbit Studios, S.L. All rights reserved. Published by Singular People, S.L.. RTSE Technology ©2012-2017 Wildbit Studios, S.L. All rights reserved.